Immortelle oil is a natural product that has been used since ancient times, mostly because of its pleasant smell. However, this plant has amazing anti-aging effect. Thus, it became known as an effective tool to remove wrinkles and scars from the face. The first time it was used was in France. The name comes also from French language which means immortal. The reason for such a title is the fact that this plant in a completely natural way revitalizes your skin and all of its cells. This appreciated product is now increasingly coming back into use and is highly in demand. It is more expensive than other products because to make it, it requires a large amount of flowers. Read below to find out more about this plant. Find out how it all can be used for medicinal purposes. In some areas this plant is cultivated because of its yellow flowers – which are exceptionally beautiful and fragrant. As such, it has attracted the attention of people who have enjoyed this pleasant note. Gradually they discovered its benefits to health, especially when it comes to powerful oil. Therefore, today, these shrubs are grown mostly near the coast. Warm climate that prevails in those regions favors the cultivation of this plant. It thrives in places where it is almost impossible to plant a plant, hence its name the immortal. This herb defies harsh conditions. Cultivating immortelle is therefore an easy process, but it is above all necessary to find a place that is sunny all day. On the other hand, it copes with the winter and low temperatures. The only thing it can do harm to it is soil that is acidic, as well as a large amounts of moisture. Planting immortelle means removing weeds, since it can prevent the growth and development of plants. It is advisable to avoid pesticides that pollute the soil. Watering is necessary only in the early stages, until you strengthen the root of the tree. For the first yield, it is necessary to wait at least three years. At full maturity, this plant gives about 7-8 tons of flowers per hectare. When they are harvested, they should be dried. Then their weight decreases and becomes practically halved, but in the end you will get around 4 tons of flowers per hectare. The drying process involves the disposal of these parts of the plant at a temperature of 35 to 40 degrees.. There is a folk recipe for its preparation which will later share with you. The plant immortelle is unjustly neglected in recent times though it is very healing and helpful. In the first place it is effective against inflammation, and also it can be used for disinfection and detoxification. What is most notable is the presence of italidione a chemical compounds because of which the flowers and leaves provide regenerative properties. Hence its great popularity, since they feed cells and tissues, they act on their renewal and revitalization. Besides, an antibiotic from of immortelle has an anesthetic effect, and soothes the pain. It is particularly effective with muscle cramps. For this reason it is very useful in phytotherapy and is applied in massages of the athletes. It is interesting that this gift of nature has a positive effect against varicose veins, bruising and blood clots. Oil of immortelle proved excellent for this purpose. In addition it can be applied topically and locally, the composition is good with problems with the digestive system. If you suffer from a lack of secretion of digestive enzymes from the pancreas, constipation, diarrhea, ulcers or swelling, make sure you use it. These herbs will make sure to solve problems in a very short time. For these purposes, it is advisable to drink tea from immortelle which has a very nice and pleasant taste. How to make a maceration from immortelle? There are a handful of preparations that are being made on the basis of this plant, but more often today it is used in the pharmaceutical industry. However, the most famous product of it can be made by you at your home. As we have said, we will share with you a simple recipe on how to make oil from immortelle. For those who do not want or cannot purchase this product, simply pick the first flowers of this plant. Most important of all is that they do not have to be dried, but you can use them fresh. The amount that will be needed is not precisely determined, but make an effort to find as much as possible. First wash them remove all dirt and insects. Dry them with a cloth, and insert content into a bowl. Mash with hands so the flowers release a little of their juice and then they need to spend the night in a glass jar. Pour a good quality olive oil on them. Let them stand for about a month and a half, disposed of them in a sunny place. After that, a maceration of immortelle strain through a cheesecloth in the corresponding bottle and store it in the fridge. Pay special attention to the shelf life of the product. Namely, it can be used in a maximum of 6 months from the day you made it. Thus immortelle made in olive oil is ideal as an anti-wrinkle medicine. It proved excellent with scars and other skin problems that are very common today. Skin rash caused by the operation of the various allergens is a major problem that affects a significant number of people. This phenomenon may be accompanied by abdominal pain, or choking and attacks, which is why action should be timely. For this occasion, it is best to use oil of immortelle because it will successfully cope with the causes or the symptoms of allergies. Oil from everlasting for face is the undisputed ally for face care and it will delight you with its efficiency. It successfully cleans skin pores and removes first all impurities that rise due to their clogging. Then deeply hydrates, feeds the tissue cells, and thereby has a calming effect on the applied place. These unpleasant occurrences will be eliminated in a short time, and facial skin will be shiny, soft and you will have a uniform complexion. Signs of aging on the forehead, cheeks and neck is something you do not need you to worry about, if at hand you have this great gift of nature. Its regenerative properties on which we have already spoken of are best reflected when solving the problems in question. Therefore, using oil from immortelle against wrinkles is the best anti-aging preparation. Scars due to a variety of injuries can be a great aesthetic problem, especially if they are present on the face. Treatment of scar removal with a laser is really an expensive proposition that often does not yield satisfactory results. Therefore, you should consider this alternative solution that will meet all your expectations. Immortelle oil against scars is great as it encourages cell regeneration and successfully reduces the traces of injury. There is an effective alternative product that can be used as a substitute for conventional cosmetics. You can make it yourself. The cream for the face is easy to prepare and even easier to be applied. It is necessary to obtain 40 grams of oil from this plants, as well as the same amount of beeswax and cocoa butter. All ingredients heat in one container until it dissolves and unites. Stir until you get a compact mixture, but when it becomes uniform, remove the court from the heat and allow a mass to cool. Before it starts to get hard, pour it in the corresponding jars or plastic bowls. Use the cream in morning and evening, apply on clean face in a thin layer. It is suitable for all skin types, and it will make your skin gentle, soft and smooth. This cream for face should be kept tightly closed in the fridge, and its shelf life is up to 6 months. In addition to the benefits of oil to face, it is very effective at eliminating other ailments. All the healing properties of these plants and preparations can be put to good use. Favors all those who are looking for a natural way to boost immunity. This is the main prerequisite for the protection of the body in various diseases and disorders. 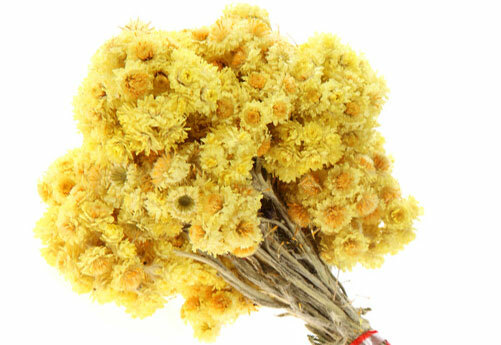 As helps clean skin of the face, so the immortelle preparations can be used for liver detoxification. It is especially interesting as it is effective for eliminating problems caused by alcohol and drugs. It helps the liver in expelling all the toxins from the body. It is particularly good to drink tea from this plant, because in this way it eliminates the symptoms and consequences of poisoning. One more benefit of the oil is that it helps the work of heart. Therefore, it can be used by all those who suffer from improper work of this vital organ. Finally, it should be noted that its pleasant smell has a positive and relaxing effect. Therefore, refresh your space with this essential oil and relieve stress. It will also help you fall asleep more easily. To make one liter of preparation required are even tons of flowers, and when commercially available it can be quite expensive. If you are interested in the essential oil of Immortelle, price for vials of 2.5 ml costs about 15 dollars and up. This is for some people really a lot. For this reason, we suggest that you make this preparation yourself. Be sure to read the recipe, which we shared with you earlier in this article. The fact is that this natural product has a very positive effect on human health. However, it should be used moderately. Women who are pregnant are advised consultation with a physician before applying the preparation. When it comes to immortelle oil side effects that may occur are mild dizziness and nausea. All these are temporary situations. Use the gift of nature, which is concentrated in this fragrant and very medicinal flower. Its rich flavor has beneficial effects and a positive influence on your inner and outer beauty and health. You will be satisfied with what this oil has to offer. You will enjoy every time you use it. We recommend our earlier article on the sesame oil and its health benefits.